Buy 1 for $5.24Buy 2 / Save $0.28!Buy 3 / Save $1.05! 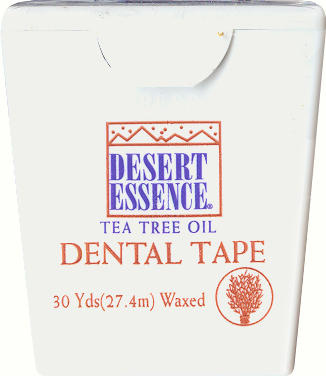 Size (inches): 2.48" X 0.71" X 2.17"
Desert Essence Dental Tape with Tea Tree Oil is thicker than regular dental floss making it ideal for those with wider spaces between the teeth. It is naturally waxed and saturated with Tea Tree Oil. For best results, use with Desert Essence Toothpaste, Mouthwash, Dental Pics, and Breath Freshener. No artificial color, or synthetic perfumes. Welcome to Country Life, the family-owned business dedicated to nutritional and lifestyle products. As a leader in the field of nutrition for 25 years, Country Life has extended its family of companies to include Desert Essence and Long Life Teas, our partners in health and beauty. Desert Essence, the first Tea Tree Oil company in America, offers a purist approach to therapeutic natural beauty, oral hygiene and body care. Long Life Teas follows the philosophy of ancient Chinese Herbal Medicine by blending balance and harmony to every cup. We at Country Life are pleased to provide the most innovative and effective health and beauty products for today's health-conscious lifestyles.